1. Place the flour, almonds and icing sugar into a large bowl and mix all the ingredients together until they are well combined. Add the butter and rub the cubes into the dry ingredients until you get a mixture that looks like fine breadcrumbs. 2. Add the egg yolk and 1 tablespoon of cold water and stir into the flour with a round-ended knife until the mixture starts to clump together. Turn the contents of the bowl onto a large piece of clingfilm and knead briefly until all the pastry has come together into a ball, then wrap and chill for 30 minutes. 3. Preheat the oven to 180°C, gas mark 4 and place a 23cm loose-bottomed fluted tart tin onto a baking tray. Roll the chilled pastry out between two pieces of clingfilm into a circle about 5cm wider than the tin. Press the pastry into the tin, prick the base with a fork and roll a rolling pin over the top to cut the excess pastry off. 4. Line the pastry with a scrunched piece of baking parchment and fill with baking beans, rice or pulses. Bake for 20 minutes, then remove the tart from the oven and take out the filling and parchment paper, then bake for a further 10 minutes so the base of the pastry is crisp. Allow to cool completely before filling. 5. To make the panna cotta filling, soak the gelatine leaves in a bowl of cold water and leave to soften for a few minutes. Pour the cream, milk, sugar and seeds from the vanilla pod into a saucepan and heat gently until the sugar has dissolved and the mixture is beginning to bubble, then remove from the heat. 6. Squeeze out the gelatine and then stir into the warm cream mixture until it has dissolved. Pour the mixture through a sieve into the cool pastry case, filling it right up to the top, leave to cool then chill in the fridge for at least 4 hours or overnight until set. 7. 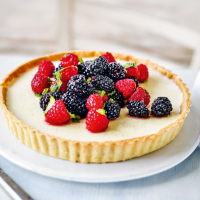 To finish, macerate the raspberries and blackberries by placing them into a small bowl with the lemon juice, torn mint and caster sugar. Stir through and leave for 15 minutes before using to decorate the set tart. Serve straight away.